It's not often that I find I'm lusting over more new drugstore releases than high-end ones. But right now that seems to be the case with a list as long as my arm on the notes of my phone mostly of beauty launches you can pick up in either Boots or Superdrug. So today I thought I'd share the best of these new beauty launches while hopefully not enabling too much spending! These days you can blink and miss an entirely new beauty brand launch so if you haven't ever heard of CYO, a makeup brand new to Boots, I'm not surprised. I personally know very little about them either, but what I do know there is no product costs more than £7.50 in the line, making this an affordable drugstore brand, and there are quite a lot of pretty items I want to get my hands on! The star of the show in my opinion that I wanted to share in this post is the Crush On Metal Metallic Eyeshadows that look like something Kiko would come up with. Available in 5 glorious metallic shades these look like they will pack some punch in the pigmentation department and basically need to get in my makeup bag! I think I will have to try these very soon and share my thoughts on them with you! Makeup Revolution has done it again, coming out with another dupe product! This time it's with a range of lip liners that look very similar to Charlotte Tilbury Lip Cheat Lip Pencils. For now, the line of lip liners can only be picked up from Tam Beauty and there isn't much about them in the way of reviews just yet. However, Safiyah Tasneem has got some great swatches up already here. I think I will wait until these are available from Superdrug and pick up 'Greatest ' as it looks the most similar to Charlotte Tilbury Pillow Talk Lip Cheat and I'm keen to compare the two. Last year I reviewed the Lacura Exfoliating Mud Mask from Aldi and it turned out to be an exact dupe for GlamGlow Youthmud Treatment mask, saving lots of people £30+! While that mask is long gone as it was an Aldi specialbuy there's now a new face mask in town that I'm hoping with be a dupe for Glamglow Supermud mask - it looks like it could be! A friend has kindly picked me up the mask already (you do have to be quick with these kinds of specialbuys in Aldi) so I will be posting a review in the next week or so to let you know how it compares to Glamglow Supermud. I'm excited to try it out! Pretty packaging gets me every time! Like a magpie, I was drawn to this new highlighter duo compact from ELF. While the packing is to die for, the two powder highlighter also look pretty dreamy and perfect for spring/summer - which will be here eventually! This is also a collab product with @thatsheart which I will admit I'm not up with at all, but always happy to support fellow beauty lovers online and it really does seem like she's come out with an amazing product here. 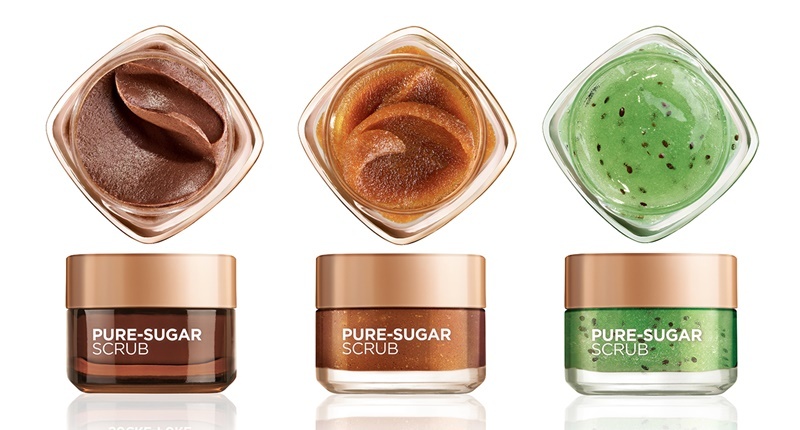 Onto a range of new facial exfoliators from L'Oreal now! While I do love my chemical exfoliators most of the time my attention was peaked when I saw these physical scrubs had launched. There are 3 available (Glow Scrub, Smooth Scrub and Clear Scrub) and what I like the most is that they can also be used as lip scrubs - ingenious! As I'm not about the harsh face scrub life the Smooth Scrub appeals to me that most as it contains 3 fine sugars, Cocoa Butter, Coconut Oil and Cocoa Grains and does look very fine in texture. These really do look as good as the clay masks, L'Oreal brought out some years ago and I'm pleased they are taking a more gentle approach to exfoliating. When it comes to lotions and potions I'm all about gourmand scented products, which also transcends to hair products if I can find them! However, it's often hard to find shampoos and conditioners with a sweet/foodie scent - until now that is! While the name Choco Locks and the bring pink packaging doesn't float my boat the scent of this range definitely does. I like to stay away from cheap shampoos where I can so I think I will be trying out the conditioner from the range, well if it passes the smell test in store that is! Anyone else have to smell shower gels and hair products before they buy them and often get a bit of the product on your nose? Just me then! While I own a lot of illuminating drops and highlighters, which I love, I don't own anything luminising that would be suitable to apply to my entire face under foundation without looking like a disco ball. However, I love the idea so I've totally been drawn to this semi-recent launch that consists of 5 different primer shades including this glow-enhancing one. I haven't seen much about this primer but from what I can tell it's a light pearl shade and comes is a light serum type formula which I like the sound of. Plus the packaging is pretty special! You can also find each of the five primer with three other products in 4-piece L'Oreal base sets here for only £11 - really good value for money! Lastly, I wanted to include this SPF 30 primer that comes in three different shades to counteract different pigmentation issues. I'm totally new to Touch in SOL products (they have just launched in the UK) but as they are a Korean brand I already feel I trust them, especially when it comes to SPF products. If you use chemical exfoliators then an everyday sunscreen in a must and this really does seem a nice and affordable offering. Although I have more than enough facial sunscreens I think I will have to pick up an SPF based product from Touch in Sol soon. Let me know if you are as excited as I am by any of these new budget beauty launches!